I am on a roll! This new pendant is 'Atlanta Bound' as I completed it on a recent flight to visit family in... Atlanta! For the Florida woman sitting across from me waiting to board our flight, this is the one you so kindly complimented me on. 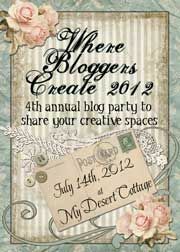 It was a nice reminder that I should get blog cards made to pass along instead of writing it on a scrap piece of paper both of us were looking for. 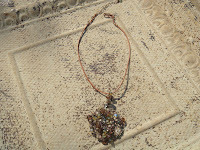 There are various crystals in this pendant with a large enough bale that you can interchange with any type of necklace. (Click on the picture for a close-up view). I love the combination of brown with blue tones and a hint of silver. Less than 2 months and we move back to Phoenix after a beautiful and adventurous summer in Oregon. I have seen more deer in the last several months than I have my entire life. Farmers Markets are a weekly event for me and I know I will miss this the most. I am such a Foodie! I have managed to fit jewelry making into my activities, thankfully! Introducing Barbara Jean. This bracelet was a birthday gift to my friend Barbara who picked out the beads. I had to add the earrings because I couldn't stop at the bracelet! She loves the set and gets compliments every time she wears it. These earrings, made with freshwater pearls and citrine on sterling silver hooks are so light weight you won't feel them. 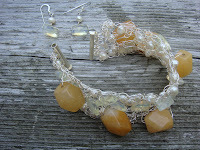 The bracelet also contains pineapple quartz finished with a sterling silver slide bar clasp. I welcome your comments and jewelry orders!